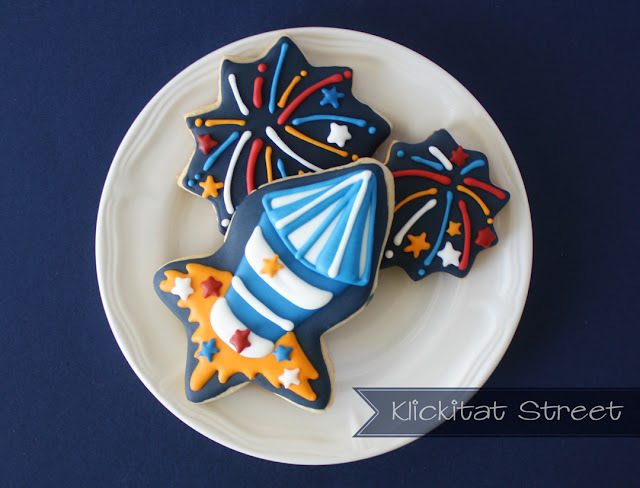 Earlier this week I posted rocket cookies that were made using a basic star cutter and I figured I'd show you how to make the fireworks too. The rockets are a little more time consuming but the fireworks are super easy and both can be cut from the same cutter! Yes, the fireworks were also cut from a star...can you see it? 15 count royal icing in red, white, blue, yellow and a dark midnight blue for the base. 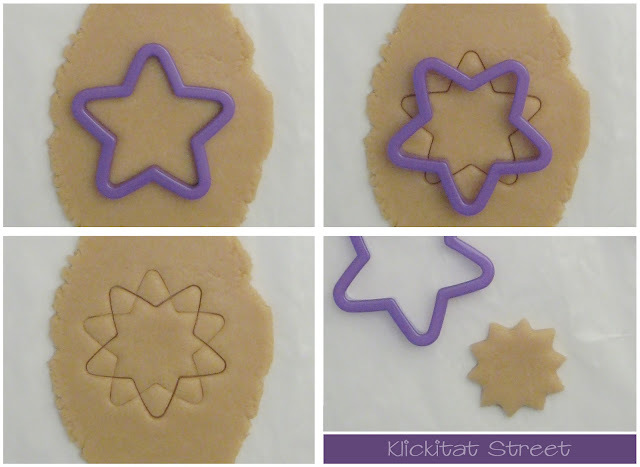 You can cut these cookies from a basic star cutter (which I did) or use a sunburst cutter. Either way they come out the same in the end. I like using the star cutters because I have them in many different sizes. To start, cut the dough with the star cutter. Then rotate the cutter, center it, and cut again. Remove all the outer pieces of dough and the remaining center will be a sunburst! Outline and fill the cookies with midnight blue icing and allow the base to dry for several hours or overnight. Choose a spot that will be the center of the firework burst and pipe gentle curves to the outer points of the cookie. Finish the cookies by piping little stars here and there. 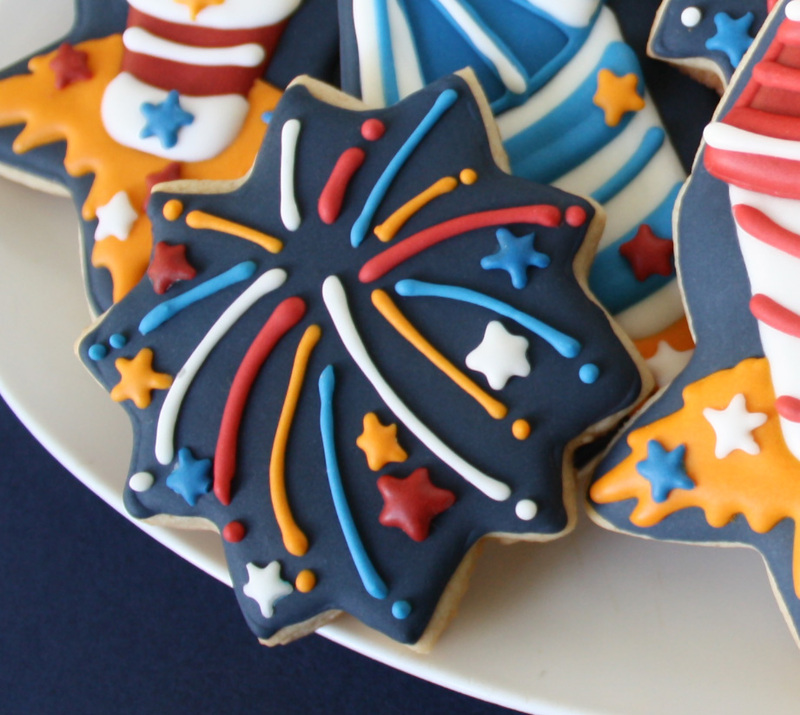 If you are uncomfortable piping the stars directly on the cookie you can pipe them on wax paper and let them dry. 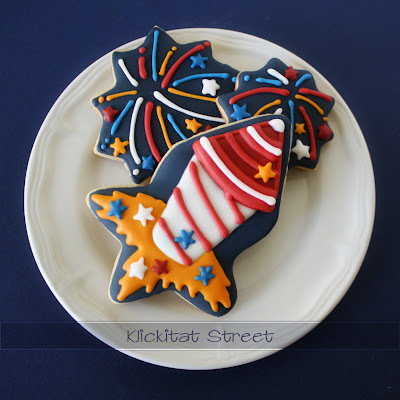 Then you can choose the best stars and "glue" them to the cookie with a dot of icing. That's all there is to it! 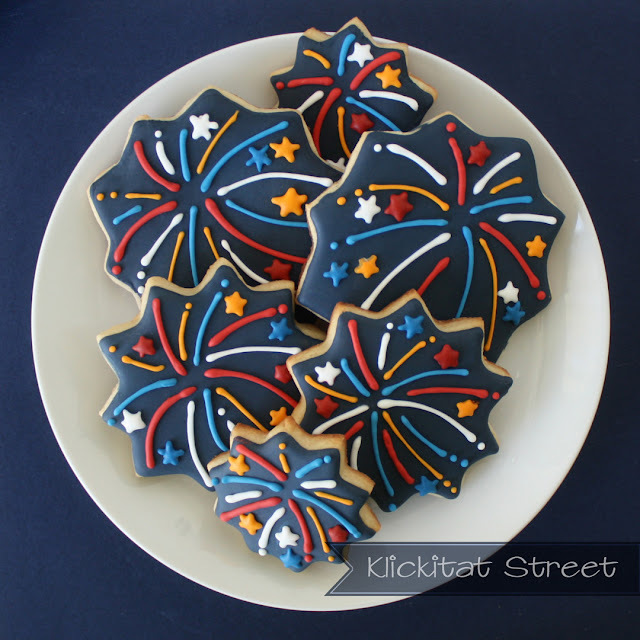 The firework cookies look great on their own or make fun accents to other 4th of July cookies. You can visit this post for a tutorial on making the firework rockets. I know a lot of people will be starting the Holiday early today. Stay safe and enjoy your weekend! Oh my goodness I am so excited about today's post! You may have noticed I haven't been posting very often lately. For some reason I've been in quite the cookie funk the last few weeks and was even wondering if I'd lost my cookie mojo. But wouldn't you know it, right when I needed it most the super talented and very sweet Callye from SweetSugarBelle approached a few cookie friends with a challenge to create something special using a basic star cookie cutter. Not only was I completely blown away to be included in such a group of talented ladies, but this was just the push I needed to get back into cookie making again! Start by cutting a basic star using the cookie cutter. Using a sharp knife cut an arrowhead between two points of the star. It's easier to get a nice uniform cut if you use a little plastic template. Carefully transfer both shapes to a baking sheet and make sure they are pieced together. Once the cookies are baked and cooled you shouldn't have problems with the seam breaking. After the cookies have cooled completely outline and fill them in midnight blue royal icing. Allow the base to dry for several hours or overnight. (I forgot to take pictures of the middle step, so digital cookies will have to do!) Outline and fill the firework in sections allowing each section to set about 30 minutes or so before filling the next section. 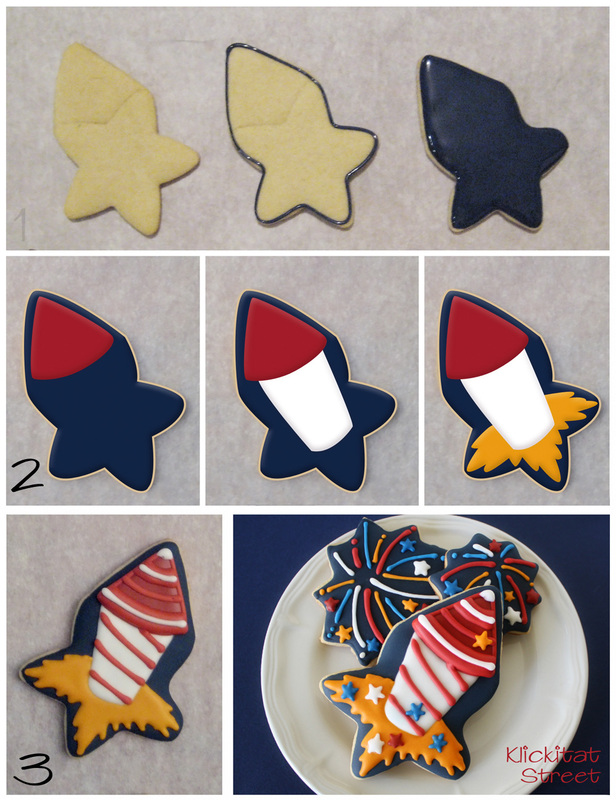 Finish the cookies by adding stripes and stars to the rockets. 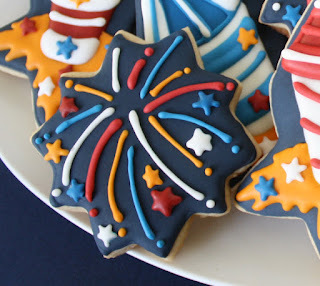 If you're hesitant about piping the stars directly on the cookies you can make them as icing transfers by piping them on wax paper and letting them dry. Once the stars are dry you can choose the best ones and attach them to the cookies with a little dot of icing. 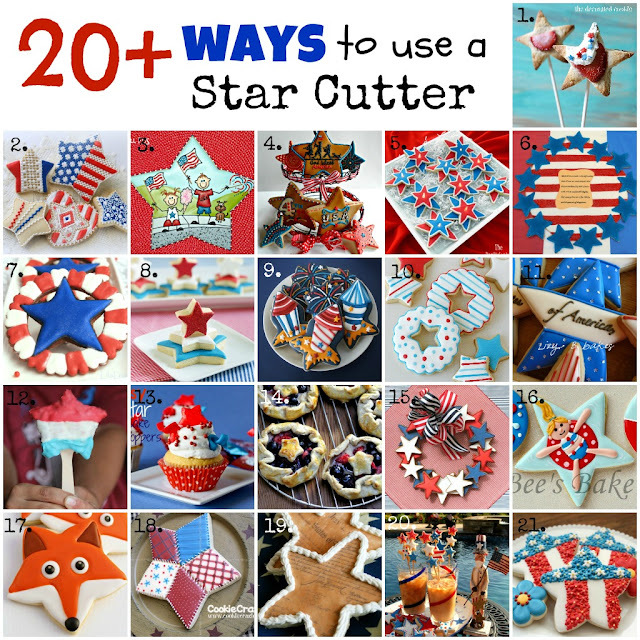 Can you believe this fabulous group of ladies have come up with another 20 things you can do with a simple star cutter? I am in awe of each and every one of them! Make sure you go visit all their sites to see these wonderful creations close up!